Welcome to Low Tide at 417 30th Street, mid island Sunset Beach! This light-filled beach house is within 167 yards of the beach access point. 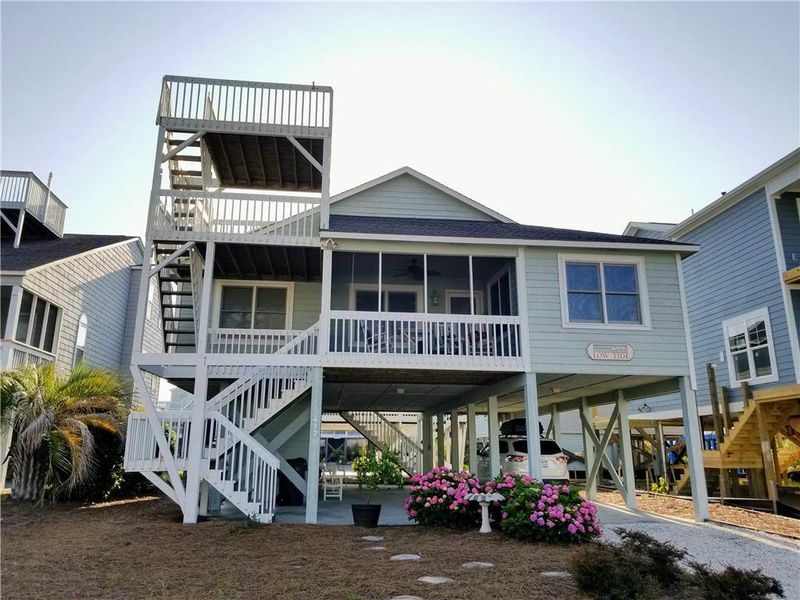 The cottage offers easy living with front and back porches, and a crow's nest for great sunset views and a place to sit and ponder. Screened front porch has a ceiling fan. Decking and crow's nest stairs are sturdy and in excellent condition. There is a picnic table in the shade under the house, and an outdoor shower. The four-bedroom two-bath cottage has an open floor plan with the common area in the middle flanked by two bedrooms and hall bathrooms on each side (tub/shower combinations). Ceiling fans in every bedroom and in the living room. Sleeping for 8: King (new mattress), two queens, and two twin beds. Never been rented before summer 2018.